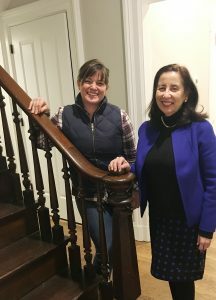 In early January, the Community Learning Center Institute opened its doors to Oyler House, a community center aimed to support Lower Price Hill residents in every aspect of life and community. The Oyler House builds on a vision decades in the making, with the premise that for a neighborhood to thrive, it needs an anchor institution through which it can flow. For one community, that anchor began with a school with an uncertain future. 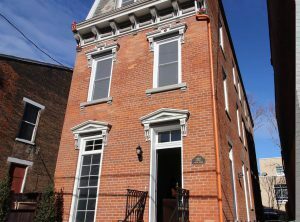 Lower Price Hill — The restoration of a historic home that sat vacant for more than 17 years is complete – and a community center has emerged as a symbol of a new era for this historic riverfront community with a proud Urban Appalachian heritage. In January, Oyler Community Learning Center Institute held a housewarming party for the opening of Oyler House. Located at 2112 Hatmaker Street, the 1866-built home was acquired by the Hamilton County Land Reutilization Corporation (Landbank) in 2015 via expedited tax foreclosure and sold to the Community Learning Center Institute in 2016 for the expansion of the Oyler campus. Directly across from the front doors of the Oyler School, a national model for community learning centers, the new Oyler House conveys hope where it had once been a symbol of the blight that has plagued the neighborhood for decades. Revitalization of the Lower Price Hill community began with the redevelopment of the Oyler School from a traditional elementary school to a prek-12 community learning center. As the neighborhood is isolated and was without access to the services necessary for children and families to thrive, the Oyler community learning center campus now includes partnerships with an on-site health center, vision center, dental clinic, early childhood program, mental health therapists, college counselor and hundreds of other programs and volunteers – all creating the conditions necessary for learning. But beyond the school walls, the conditions necessary for children to learn and thrive must include decent housing, access to green space and clean air, recreational and cultural opportunities, and safe, quiet streets. er Price Hill Plan has provided a road map for the development of a network of partners who are working together under Ms. Hall’s leadership to implement the Plan. With the removal of blight and the restoration of vacant homes to single family home ownership as the community’s highest priority, Ms. Hall has coordinated a network of housing partners including Habitat for Humanity to rehab long vacant homes. Oyler House is open to partners, students, and the community at large. There will be a food pantry offered 2x/month, supported by Freestore Foodbank, and cooking classes. Habitat will offer classes in home ownership and maintenance. For more information: https://oyler.cps-k12.org/about/partners.